The topography of the Uncompahgre Watershed is highly varied, ranging from snow capped mountains to barren desert lands. 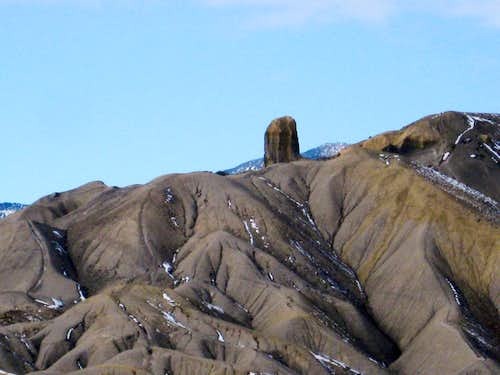 Major landforms include the Uncompahgre River Valley, the Uncompahgre Plateau to the west, the San Juan Mountains to the south, and the Gunnison uplift and Adobe badlands on the east. are characterized by abrupt sloping hills of Mancos Shale dissected by rugged winding canyons. The dobies extend from Delta County, through Montrose County, and into Ouray County and are extensively used by off‐road vehicles. Unaweep canyon in the Uncompahgre Plateau. The Uncompahgre Plateau is the remnant of an ancient highland. The ninety‐mile long Plateau flanks the west edge of the watershed, extending from the San Juan Mountains to the Colorado River. 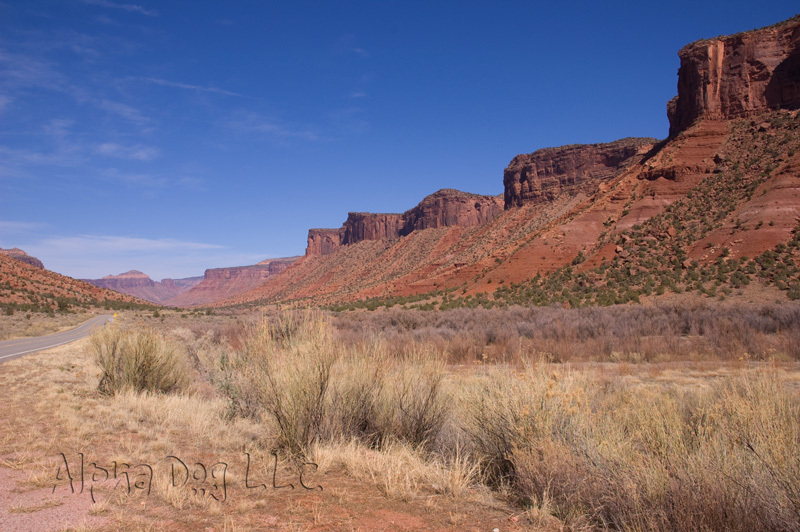 The Plateau is incised by many deep canyons separated by flat‐topped mesas. The Cimarron Ridge forms the backdrop for many scenic photos outside of Ridgway, CO. The jagged skyline east of Ridgway is consists of volcanic lava flows and ash layers. The rounded slopes below are weathered Mancos sculpted by glacial moraines. 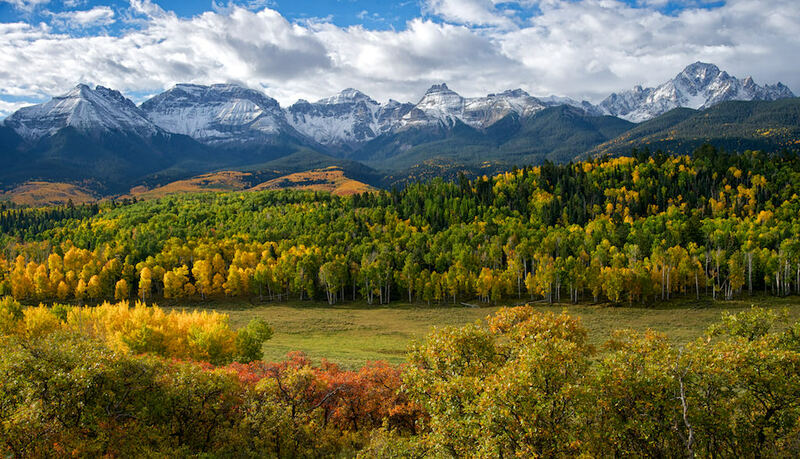 Mount Sneffels Range in the fall, part of the San Juan Mountains. mineralized mountain range in the Rocky Mountain system. Natural features of the mountain range include spectacular breccia pipes, iron‐red stained red mountains, and U-shaped valleys, cirques, horns, and tarns carved by glaciers. Agriculture flourishes in the Uncompahgre Valley through the series of laterals, canals and ditches which bring water from the Gunnison River through the Gunnison Tunnel. terraces that run parallel to the river. These terraces make up a broad, highly dissected valley with a gentle to moderate down‐valley slopes. The Uncompahgre River begins in the high San Juan Mountains in Como Lake. The river flows north through Poughkeepsie Gulch and through the historic Red Mountain mining district where it is joined with Red Mountain Creek at the head of the Uncompahgre Gorge. Other major tributaries join the Uncompahgre River as it flows north. Canyon Creek joins Uncompahgre at Box canyon, in Ouray just below the Ouray Hydro Dam and Dallas Creek contributes and meets the River system at Ridgway Reservoir. Downstream of Ridgway Reservoir, the Uncompahgre River is joined by Cow Creek.The Uncompahgre River flows through the Town of Colona towards the City of Montrose. North of Montrose, the Uncompahgre gains flows from Cedar Creek and Spring Creek as it moves towards the Town of Olathe. The Uncompahgre River gains flows from the Uncompahgre Plateau via Dry Creek approximately five miles above the confluence with the Gunnison River in the Town of Delta. Flows north of Colona are highly regulated by a complex system of water diversions and canals.